A 1930's booklet on Motor Cars presented with Boys' Magazine. Homepage. This page: A look at a Boy's Magazine Wonder Book discussing the motor-car and boat. Several "Wonder Books" were given away with copies of Boys' Magazine in the early 1930's, and this is the one that caught my eye. Titled "Motor Cars and Motor Boats", it was the sixth in the Wonder Books series. On its cover is a great illustration of a racing car at speed, with driver and co-driver clinging on for dear life, as the driver negotiates a twisty road. Although un-dated, the content within its pages suggests a date of the early 1930's. Fortunately, as I'm not a boating fan particularly, all but one of the features in this booklet refers to the motor-car or motor-cycle. The opening article introduces the avid young reader to the World of Wheels - "from the beginning - to the present day". This takes him or her from the early days of Cugnot, and his steam carriage, through to other landmarks such as the British-built six-wheeled Goldsworthy Gurney, a hefty steam coach: "The first two wheels were steered like a bath-chair, the second pair followed them like the back wheels of a carriage, and the last pair trailed behind, driving the lot from an engine carried above them". As time went by, steering configurations and the development of a differential for the back axle in later vehicles, are also covered. The story of the motor-car is then brought bang up-to-date, with an illustration of a fine Rolls-Royce 40/50hp Phantom, costing at the time a whopping £3,031. Any child wondering about the parts that made up the chassis of a typical '30s car, would have their questions answered on page 6. Equally, anyone with an interest in internal combustion would find the engine article on pages 7 and 8 particularly helpful. There then follows an article titled The Record Smashers - Triumph of the Speed Demons, which, as the title suggests, looks at the heroes of land and water speed record breaking. Sir Malcolm Campbell, and his exploits the previous year at Daytona Beach behind the wheel of Bluebird, get good coverage, and Sir Henry ("Tim") Birkin is illustrated aiming a Bentley around the curved banking of Brooklands. Kaye Don, in Miss England II, took the water speed record on Lake Garda at an average of 110.2mph. Campbell appears once again, as author of "Behind the Controls - How to Drive Cars, Motor Cycles, and Pilot Motor Boats". Here he looks into the delicate world of clutch and throttle usage, gear selection, and the use of Advance and Retard with regard to an engine's ignition system. The typical modern car is far from perfect. The ordinary vehicle has its engine in front, three or four speed gears, a friction clutch, the driver behind the engine, a shaft running the whole length of the car to take the drive to the back, where the driving wheels are. The car of the future, the perfect car, will almost be exactly opposite. The driver will sit in front. All four wheels will drive the car - this will avoid wheel-spin and loss of power, also wear on tyres. All four wheels will steer - that is, when the front wheels are turned to round a corner, the back wheels also will swivel to complete the circle. They will, of course, turn in the opposite direction to the front wheels, so that all four wheels will follow exactly the same curve, as though they were running on rails. This will make skidding practically impossible, for most skids, on corners, are due to the fact that in turning the back wheels at present try to turn in a smaller circle than the front, whereas the centrifugal force tends to make them follow a wider course. To allow the driver's seat to be right in the front, the engine will have to be at the back, slung right between the back wheels, where it will not cause rebounds on bumpy roads. And it is in the engine and gearing system that the greatest change will be noticed. The steam and electric engines, which for a time vied with the petrol engine for popularity as the motive power, have the advantage that they do not need a clutch. The engine can be started up from standstill. You turn a switch, and the electric motor starts. Open the throttle, and the steam engine starts up. But a petrol engine has to have something else to start it, and before it drives the car the speed gears must be used and a friction clutch engaged. This is the greatest disadvantage of the modern car. The car of the future will be driven by petrol, but its engine will start at the pressure of a button, and will be able to start in gear. Probably a form of petrol turbine will be used. Experiments are being carried out with these engines, which obtain their power by passing an exploding mixture of petrol gas and air over the vanes of a turbine rotor, similar to the steam one. At present this type of engine is in very crude form, but there seems no reason why it should not be as powerful as the ordinary petrol engine. Externally, the car of the future will look much like the new car recently supplied to the Prince of Wales. It will be perfectly streamlined, low and long, with the wheels set well apart. The controls to be manipulated will be merely a starter, accelerator, and brake - the clutch and gears will not be there. If gears are necessary, they will be automatic, changing themselves as the strain on the engine becomes too great. The illustration shows a car reminiscent in some ways of the Tatra, and the Crossley Streamline. The remainder of this small booklet contains an article on Miss England II, the speed record boat, a look at motorcycles old and new, and ends with the news of a motorcycle speed record attempt that was in the planning stages. J.S. Wright was down to ride this exciting-looking machine, known as the Excelsior J.A.P. Racing Special. He was definitely the man for the job, holding as he did the then-current motorcycle speed record of 150.24 mph. More items similar to this can be found in the Motoring Collectables section of the site. Several items described in this section feature artwork similar to that on the booklet above. 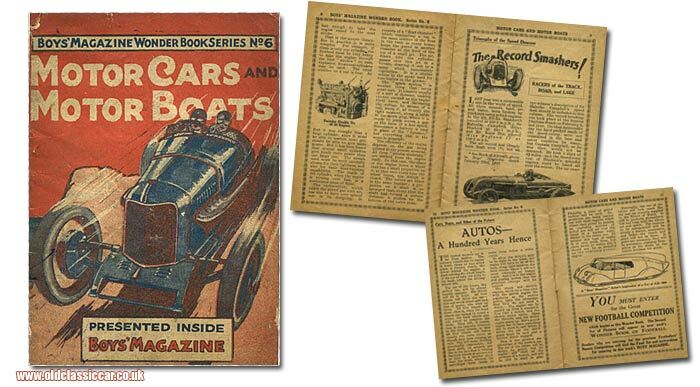 For instance, a number of Nelson Lee Library comics from 1927 are mentioned, as they feature land-speed record cars of the day on their covers (for instance Parry-Thomas' Babs). An early issue of Pluck, from 1923, features racing cars at Brooklands on its cover, and The Modern Boy comic could often be relied upon for scenes of motoring interest.